I would normally not report on something like this, but if you go to clickondetroit.com (WDIV-TV), read the article and view the video, you’ll hear about a guy named David Mardeuz. Dave (or ‘Friend Dave’ as my daughter calls him) is a good friend of mine. To see him having to go thru this is tearing me up inside. Dave’s home was spared, but I hear that his garage didn’t make it. I also know from experience that the smoke damage will be pretty intense. Dave…your friends are here for you. I’ll call you later. If anyone has a chance, keep my ‘Friend Dave’ in your prayers. UPDATE (11:47AM EST): I was right about his garage, according to the Detroit News. This is a report from the Detroit Free Press. 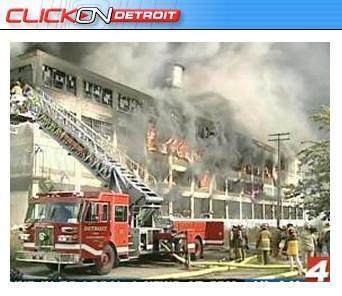 Here’s a report from WXYZ-TV and WJBK-TV. There’s even a discussion of it (with pictures) from DetroitYes.com. This entry was posted in Uncategorized on October 17, 2005 by raybilyk.